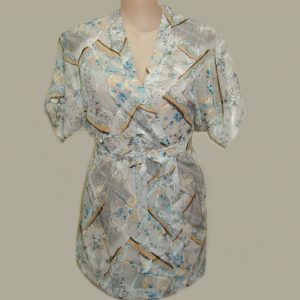 Luxurious 100% pure silk long pyjama set by Ginia in a Dove colour with a sophisticated cream print. Cut for a relaxed and fluid fit, featuring contrasting silk piping and hand crafted from the highest quality pure silk. Long sleeve shirt with button up front and collared neckline. Left breast pocket. Matching printed long pant with elasticated waistline and drawstring tie. 100% Silk is luxuriously warm and lightweight for winter, but also ideal for spring and autumn.